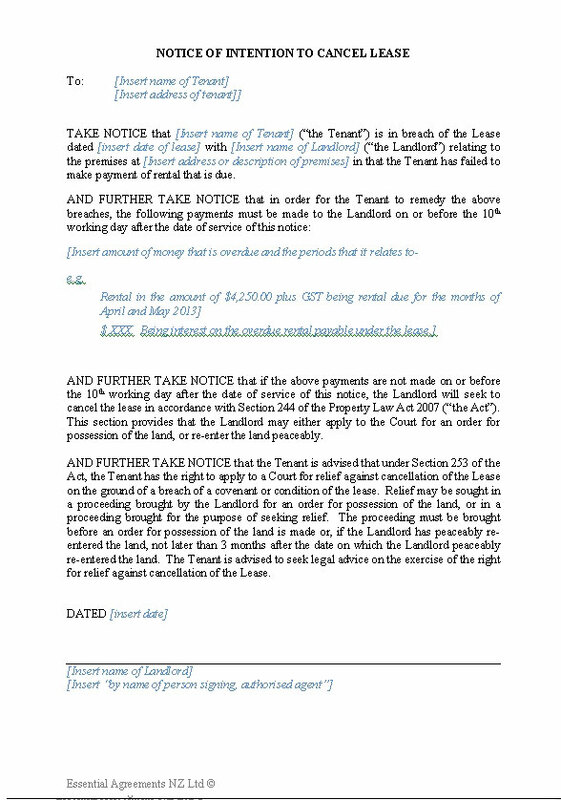 This is a Deed for recording a renewal of a term of a lease. The renewed term is acknowledged by the Guarantor and the remainder of the lease terms are confirmed. 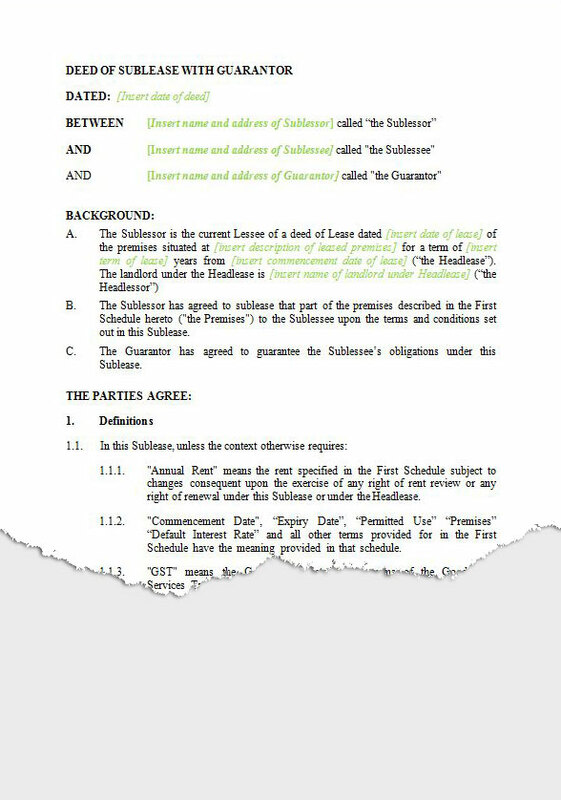 This is a Deed for recording a reviewed rental payable under a lease for the next rental period with the remainder of the lease terms confirmed where there is no Guarantor of the Lease. This is a Deed for recording a reviewed rental payable under a lease for the next rental period. The increase is acknowledged by the Guarantor and the remainder of the lease terms confirmed. A lease of plant and equipment where the Lessee is responsible for insurance and all maintenance. Can apply to any equipment. There are provisions dealing with equipment that needs to be affixed to land or buildings to operate if necessary. A lease for commercial premises with no Guarantor. The lease contains provisions for payment of rental, outgoings and a process for rental review to market value. 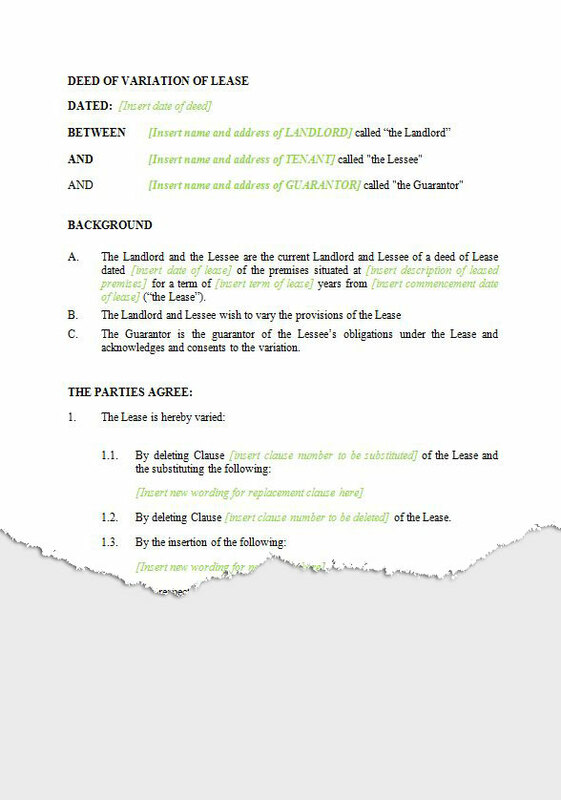 There are full clauses dealing with permitted use of premises, signage, care of premises and Tenants maintenance obligations, insurances, rights and obligations on termination, total and partial destruction of premises and assignment as well as other clauses ordinarily found in a commercial lease. A lease for commercial premises with a Guarantor. The lease contains provisions for payment of rental, outgoings and a process for rental review to market value. There are full clauses dealing with permitted use of premises, signage, care of premises and Tenants maintenance obligations, insurances, rights and obligations on termination, total and partial destruction of premises and assignment as well as other clauses ordinarily found in a commercial lease. 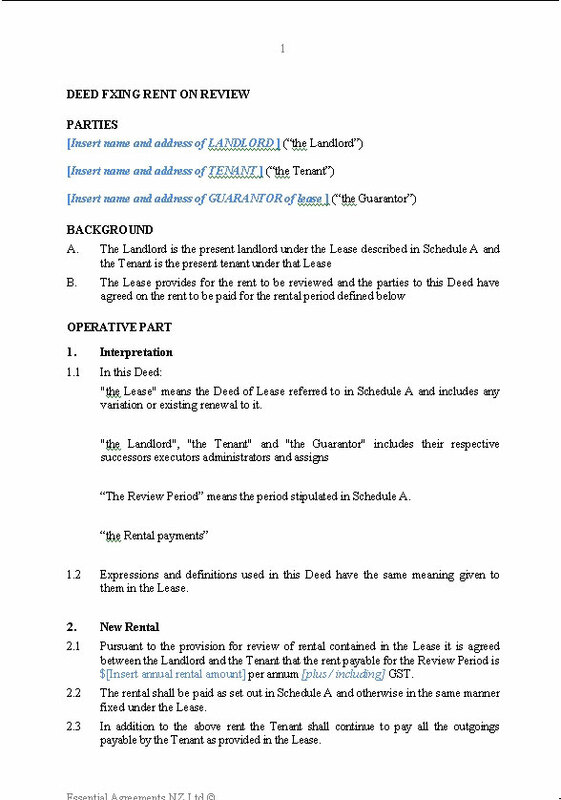 Deed of assignment of Lease with a Guarantor of the incoming Tenant’s obligations. 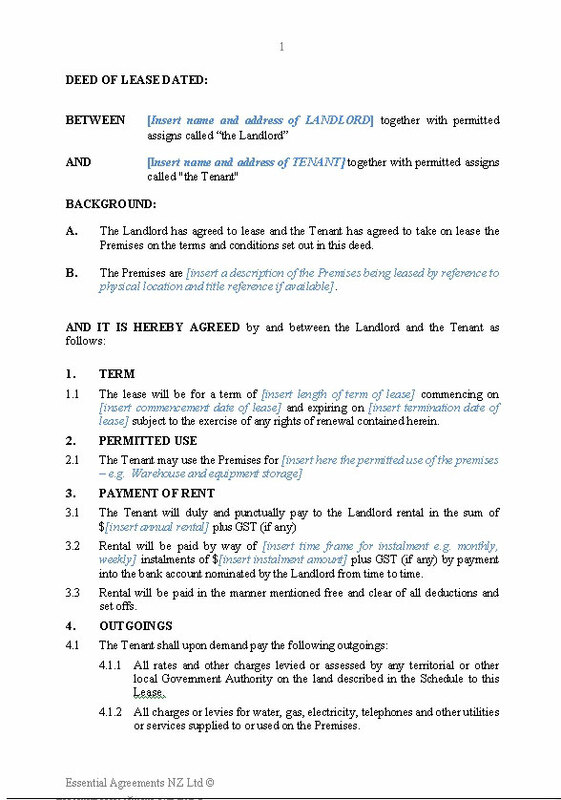 The deed is signed by the current tenant, the incoming tenant, the landlord and the Guarantor. 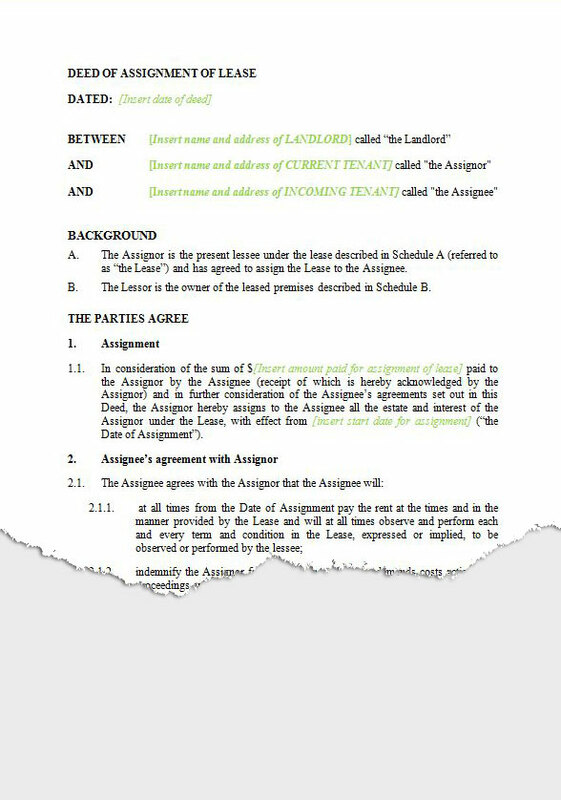 The Deed does not affect any ongoing legal liability of the assigning tenant under the lease. 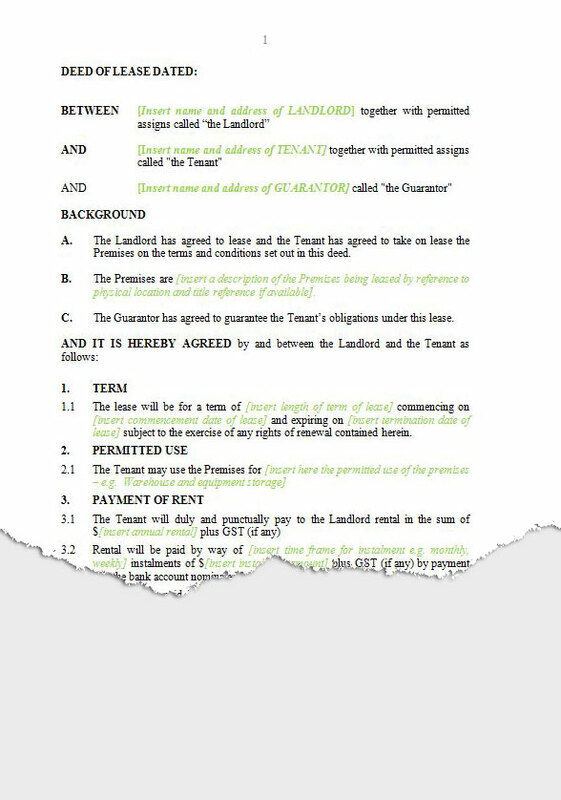 The incoming tenant indemnifies the assigning tenant against any future liability. 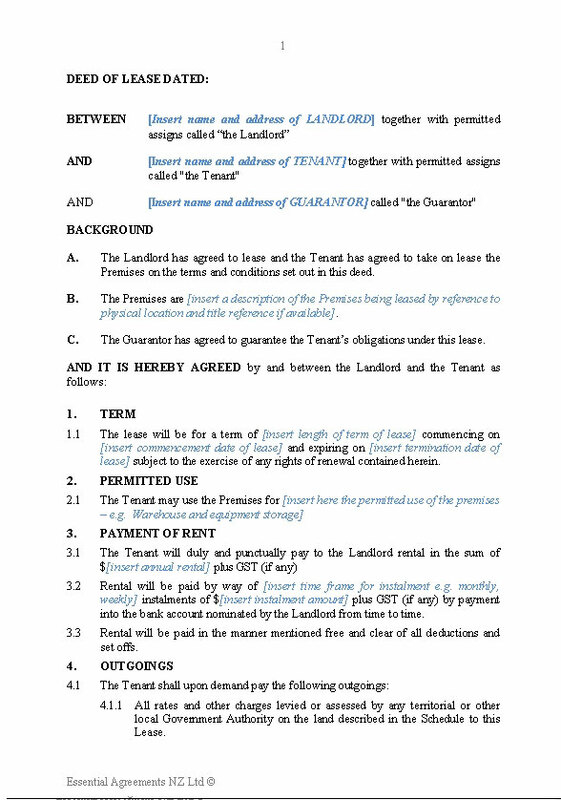 A Deed of assignment of Lease with no guarantor of the incoming Tenant. 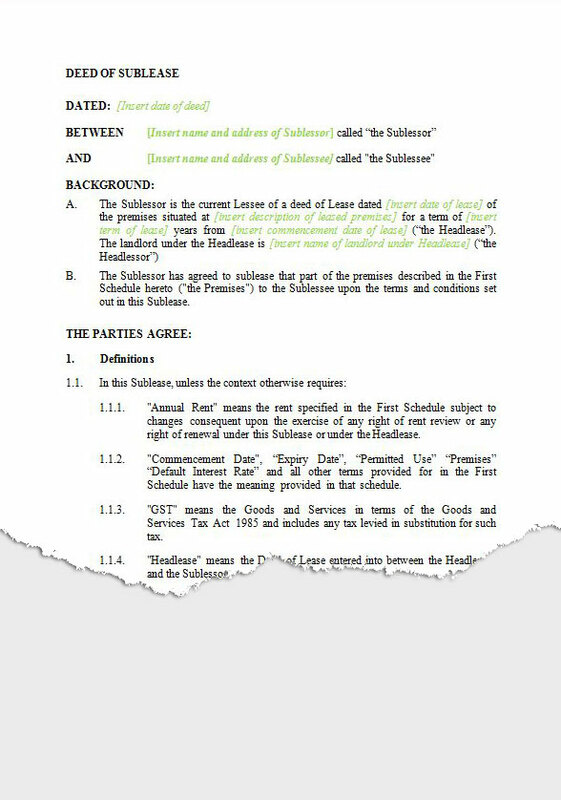 The deed is signed by the current tenant, the incoming tenant and the landlord. 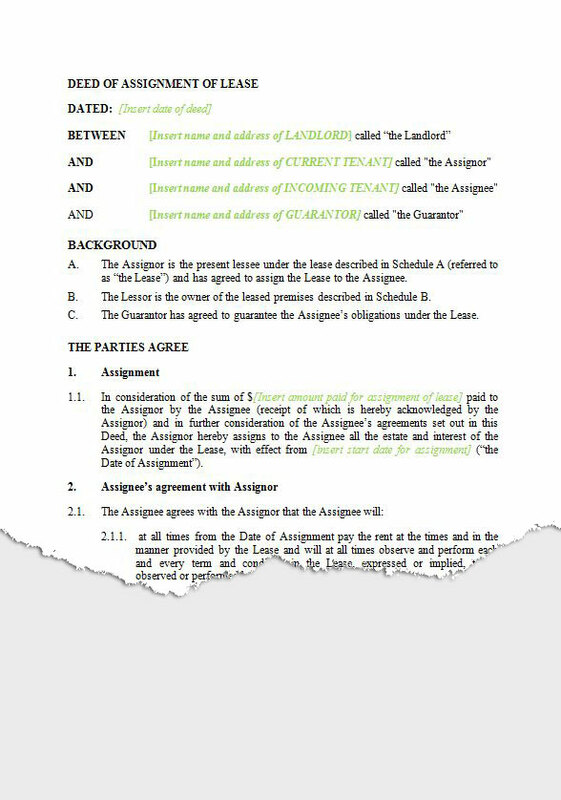 The Deed does not affect any ongoing legal liability of the assigning tenant under the lease. 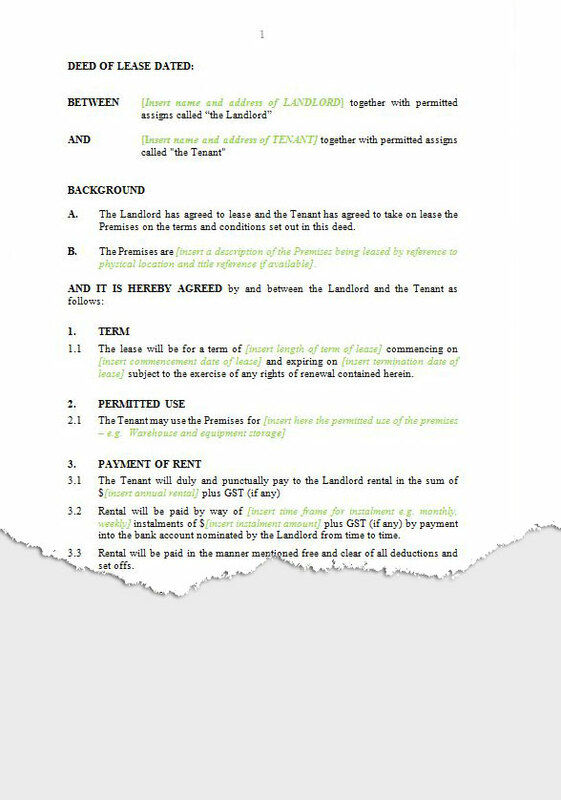 The incoming tenant indemnifies the assigning tenant against any future liability. A sublease of all or part of leased premises. The deed includes amongst other matters clauses dealing with payment of rental and outgoings, use of the premises, renewal and rent review, consent of the Headlessor and provision of a Guarantee. The sublease does not permit further subletting but can be assigned with consent of the Sublessor and Headlessor. 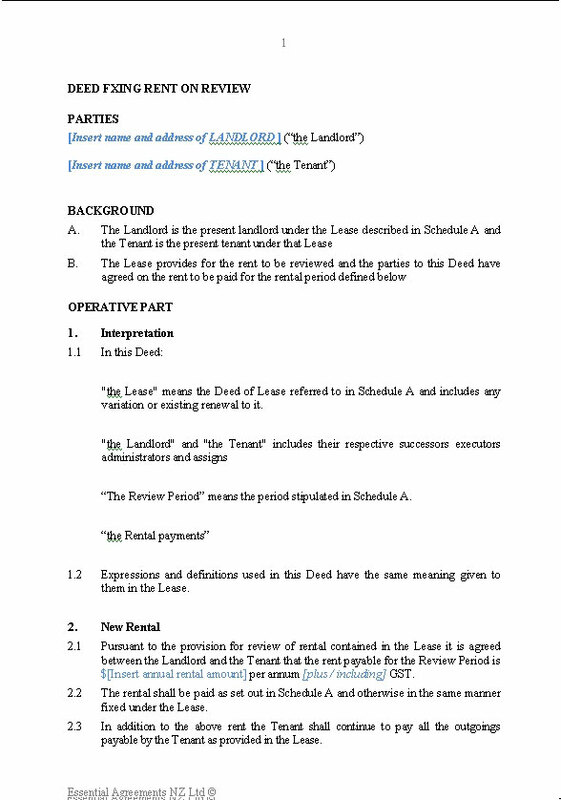 A deed to vary an existing Lease. There are options to replace or delete or add clauses. 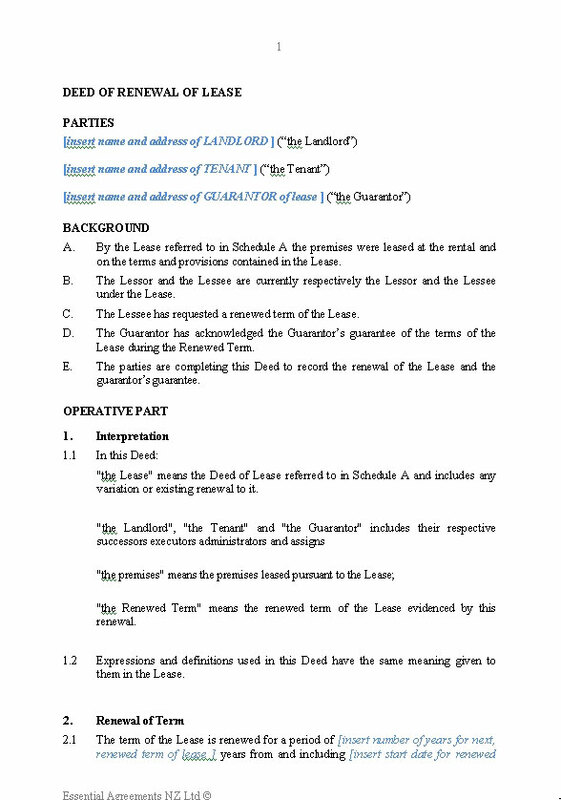 There is provision for a guarantor to consent if the existing lease has a guarantor. A sublease of all or part of leased premises. The deed includes amongst other matters clauses dealing with payment of rental and outgoings, use of the premises, renewal and rent review and consent of the Headlessor. There is not provision for a Guarantor. The sublease does not permit further subletting but can be assigned with consent of the Sublessor and Headlessor. 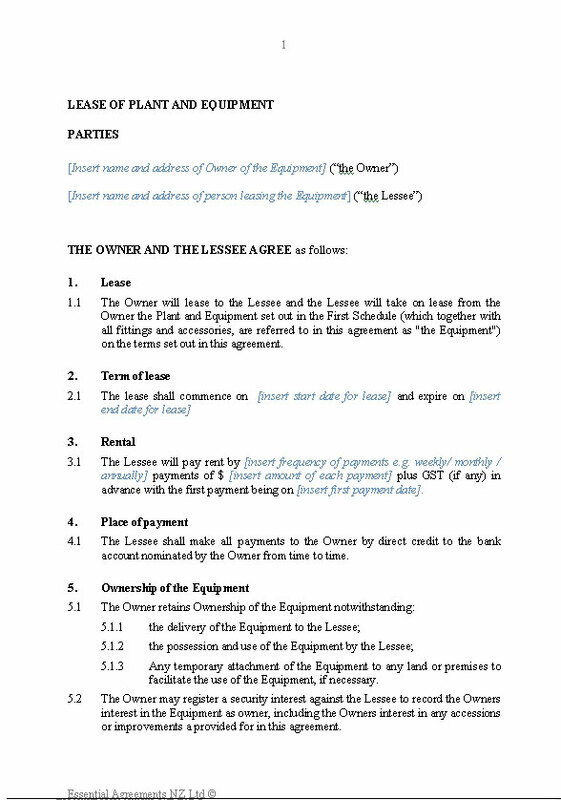 A lease for commercial Unit Title premises with a Guarantor. The lease contains provisions for payment of rental, outgoings and a process for rental review to market value. 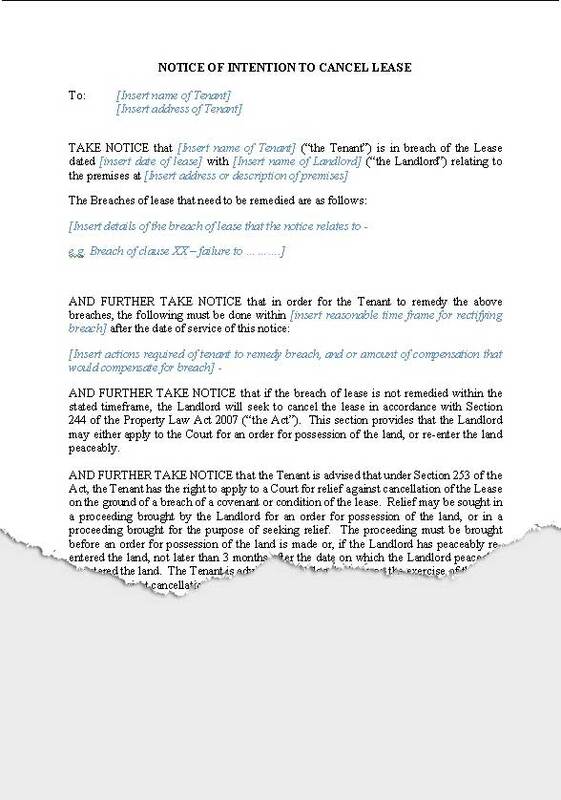 There are full clauses dealing with permitted use of premises, signage, care of premises and Tenants maintenance obligations, insurances, Body corporate Rules, rights and obligations on termination, total and partial destruction of premises and assignment as well as other clauses ordinarily found in a commercial lease. A lease for commercial Unit Title premises with no Guarantor. The lease contains provisions for payment of rental, outgoings and a process for rental review to market value. 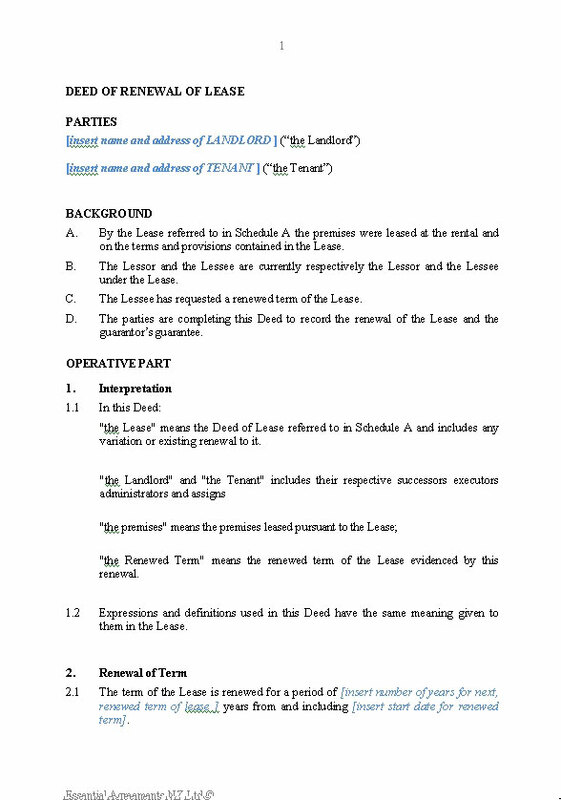 There are full clauses dealing with permitted use of premises, signage, care of premises and Tenants maintenance obligations, insurances, Body corporate Rules, rights and obligations on termination, total and partial destruction of premises and assignment as well as other clauses ordinarily found in a commercial lease.